Let’s face it: who does not love laying on the beach sand relaxing your body and mind? Most women prefer wearing a bikini when enjoying a sunny day on the beach sand. In order to feel confident while wearing a bikini (no joke, there actually is a how-to for wearing a bikini), they hop on to the quest of finding the perfect tool to trim their bikini line. Some even go to greater extents to get rid of the unwanted hair found on their body. We are here to help you get that silky smooth skin trimmed to match perfectly the outlines of your bikini. After reading this article you will know how to find the best bikini trimmer for your purposes. Note: there is absolutely nothing wrong with going on the beach rocking that natural hair of yours, but this article is for those who rather not. In the today’s world, a bikini trimmer is becoming an integral part of the woman’s grooming kit. A trimmer is used for removing the unwanted hair of your body and as the they are becoming more and more popular, the amount of options for such devices is getting enormous and thus maybe even overwhelmingly confusing. Getting a trimmer is a great alternative to shavers looking for a close shave. Using a trimmer is the best way to get a silky smooth skin and a dedicated bikini trimmer is a great alternative to other hair removal techniques such as wax and hair removal creams. Looking for the best bikini trimmer? Stay put and read the rest of this article to know how to choose the best bikini trimmer for you. Schick Hydro Silk TrimStyle 1x AAA ? NOTE: The ratings are divided for two different categories: “the all in-one trimmers” (the first two) and “the plain bikini trimmers” (the rest). The ratings between these two categories are not comparable. Alright, now that you have an idea of what you should look for we present you our hand picked list of the best candidates. Our testing group tried out many trimmers and these are the ones that made it through on our top list so you should not worry about things like blade quality when considering buying any of these trimmers – a clean shave is pretty much a guarantee. Keep in mind though, many of these devices are designed to be “all-around” hair removal devices for multiple purposes. So if you are looking strictly for a bikini trimmer you probably want to skip past the fancier shavers on the list – even though they excel as bikini trimmers also. These two devices on our list are for those who are looking for a single device for all your hair removal tasks. Braun Silk-épil 7 is the best multi purpose tool out there when you have a preference for bikini trimmers. Yes, it is mainly an epilator but with the attachment heads it will turn into a magnificent bikini trimmer. It would get bested by Braun Silk-épil 9 but as we are mainly looking for a trimmer for the bikini area, the narrower blade and more affordable price gives Silk-épil 7 the edge in this competition. Coming packed with a breathtaking set of additional goods such as the SmartLight, shaver head with a trimmer cap, precision cap, efficiency cap, facial cap and a cleansing brush cap it just works wonders. Silk-épil 7 wet dry shaver also gave out the most painless shaving experience in our whole test – as Braun advertises it really is “virtually painless” when used regularly. This is something extraordinary for those with a highly sensitive skin – minimal skin irritation is always favorable. As the whole name suggests, Philips HP6378 Bikini Perfect Deluxe Trimmer is also a wonderful all-around tool. It comes packed with six “super-precise” attachments: precision trimmer, precision comb, epilator, eyebrow comb, micro trimmer and micro shaver. These attachments turn Philips HP6378 into a wonderfully adjustable hair removal tool for all kinds of operations. The additional goods including an exfoliation glove, travel bag and even illuminating tweezers (!) make this device a serious contender on the list. The shave could be a bit closer to our liking, but if you are looking for even smoother finish you can always trust the epilator attachment of this trimmer. Read our full review here. 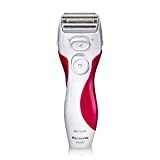 These devices are for those who already have a more general shaver or epilator in their arsenal and are looking for a plain bikini trimmer and nothing else. Keep in mind though, as they are trimmers and not epilators, the shave will not be as close as you might want to in some cases. If we had to pick one word to describe Remington WPG4030C it would be “solid”. It is a solid bikini trimmer overall and the great built-in quality makes it feel solid in your hand. Being somewhat sturdy in design it won’t suit those who are looking for a pen-like grip when trimming. Schick Hydro Silk TrimStyle is the go-to bikini trimmer for all beginners, travellers and for those who like to keep it simple. It is extremely cheap, as portable as it gets and relatively easy to keep clean. No extra precision attachments, no additional goodies, just a plain bikini trimmer and a razor on the other end. It gets the job done easy and cheap. Don’t be fooled by the admittedly cheap look of the Panasonic ES246AC – it is an excellent bikini trimmer. Being one of the most reviewed bikini trimmers of Amazon it is being used by women all around the globe. Packed with just the pure essentials (the trimmer itself, nothing else) it is very affordable and gives great value for money. The hypo-allergenic blades and the five-position trim head provide a pleasant shaving experience without razor bumps and without any irritation to the skin. Bikini trimmer is an electric device that is used for hair removal in situations that require precision. There are plenty of brands to choose from and the bikini trimmers of today come packed with loads of awesome features and they also vary in styles and colors. Why choose a bikini trimmer and not one of the alternative methods then? To start off, the technique differs from other hair removal devices – trimmers have two blades that slide across each other acting like a tiny pair of scissors. Combine that with the nature of the job in hand and the choice is quite obvious. We are talking about about a task that requires ultimate precision and accuracy. Nowadays there is an ever increasing number of brands that offer bikini trimmers with a rather powerful array of features and picking one that meets your style and comfort can be a hard task if you don’t know what you are looking for. If you are new to the bikini trimmer game you might feel overwhelmed by the amount of options and their marketing promises – naturally everyone will say they are the best you can get. Luckily we are here to help you! The first thing you have to consider is the design of the bikini trimmer. By design we are not talking about how fancy the device looks but how well it is designed to match your needs – do you feel comfortable with the grip? Do you want it straight as an arrow or do you want it to bend a little? Do you need a mirror? We are talking about an operation that needs surgical precision here so the trimmer must be top notch and the device must fit your grip like a scalpel. Ergonomic design plays a role in that. 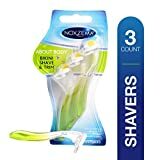 Are you looking solely for a bikini trimmer or rather an all-around shaving/trimming device to fit all your hair removal needs? Some of the devices on our list are picked for those who are looking for a single trimmer for all tasks, some are just pure plain bikini trimmers. Do you want a rechargeable shaver or are you fine using batteries? Get one that that is easy to maintain. In the end, we are talking about removing hair and hair gets stuck in places, causing malfunctions. This one is pretty obvious. Trimming will not be very enjoyable if the trimmer weighs like a hoover, let alone taking it with you on a vacation trip. Most bikini trimmers come with high-quality stainless steel blades (every single one that we recommend to say the least). It is best to buy a trimmer that features high-quality sharp blades so that you can easily trim unwanted stray hairs along the bikini line. This one is really important for those who like to maintain their bikini lines while or right after showering, also known as a wet shave. If you are one of these people go for the ones that say “wet and dry”, they are suitable for both wet shaving and dry shaving. This might seem a bit gimmicky for most people, but some bikini trimmers are featured with LED lights for poor lighting environments. Of course this might be something that you don’t need if you have adequate lighting available whenever you need it.